The United States Congress designated the Barbours Creek Wilderness (map) in 1988 and it now has a total of 5,507 acres. All of this wilderness is located in Virginia and is managed by the Forest Service. The rugged and remote mountain terrain of Barbours Creek Wilderness drops down the southeastern slope of Potts Mountain to Barbours Creek along the southern boundary. Elevations range from about 3,800 feet on the mountain to about 1,700 feet at the creek. The wilderness is comprised of hardwood forest interspersed with yellow pine where the slopes face south and west. Some hemlock and white pine grow in the drainages, including the major cross-wilderness waterway, Lipes Branch, which contains native brook trout. More than 160 species of birds have been identified here. About two miles of trail exist in the wilderness. A major wildfire burned in the wilderness and adjacent lands in April 2012. Visible evidence of the effects of this fire are evident throughout the wilderness. 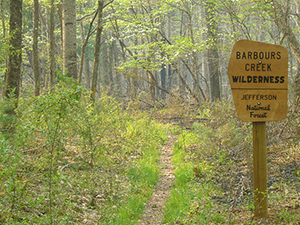 Barbours Creek Wilderness is located in Craig County in southwest Virginia. It is managed by the U.S. Forest Service as part of the Eastern Divide Ranger District of the George Washington & Jefferson National Forests. Planning to Visit the Barbours Creek Wilderness? How to follow the seven standard Leave No Trace principles differs in different parts of the country (desert vs. Rocky Mountains). Click on any of the principles listed below to learn more about how they apply in the Barbours Creek Wilderness.